So, I think I was unfair to Shades of Magic because I read it after being submerged in Throne of Glass, and it wasn’t exactly like Throne of Glass. But, I remember Shades of Magic. The world. The magic. Kell and Lila. They stuck with me, which must mean it was actually a fantastic book. Book 2, A Gathering of Shadows is fantastic. It is an amazing follow-up to A Darker Shade of Magic. It begins with pirates! What’s not to love? Pirates, magic, and princes, oh heck yeah. 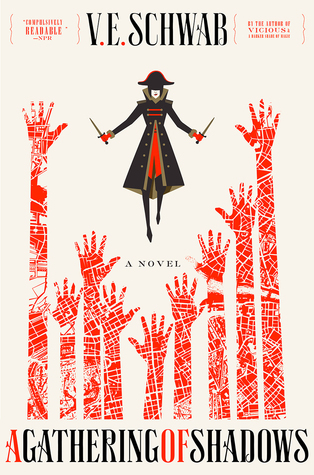 Lila is aboard the Night Spire with the mysterious and handsome Captain Alucard, learning her way through the strange new world of Red London; Rhy and Kell are adjusting to their new bond that connects their lives. A tournament is coming, one to bring the empires together and show off their magicians, and all of our protagonists are coming together – and anticipating the moment when they met had me all tingly. I’m in love with Lila’s character. A kickass woman looking out for herself, a thief, not afraid to take what she wants, but with a solid head on her shoulders. But I love all the characters in this book, Kell, Rhy, Alucard – they are all so well written and presented. They’ve all got their stories, their purpose, their meaning – woven together. This book does so many things right. It’s refreshing to read a book where the main character can be a straight guy without him having to be the macho guy all the time, and having a female character that can hold her own, and having romance be in the story without it being the major plot mover. However much I loved this book, I did feel like the plot dragged a bit. The main bad guy doesn’t really do anything until the very end, which ended on a cliffhanger. (Luckily I had the next book, so I dove right into A Conjuring of Light.) I loved how Lila was folded into the story, how she wasn’t the “damsel in distress” but the badass who saved the male lead. I love the relationships built in this book, between Alucard and Lila, between Lila and Kell, between Alucard and Rhy – they were handled with care, with delicacy, and the relationships grew naturally and healthy. There’s something magical and classical about this series. Everything about this book: the writing, the character, the world, was so beautifully done. So, A Gathering of Shadows gets a 5 out of 5. ‹ PreviousWhen will I consider myself a successful writer?